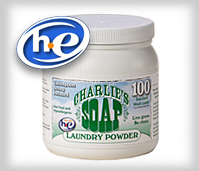 Charlies Soap History – Charlies Soap is a revolutionary high efficiency, safe,non-toxic, biodegradable and effective laundry soap for all fabrics, including silk, wool, linen, cotton and high-tech micro fibers. NATURAL MINERAL INGREDIENTS: Sodium carbonate, sodium metasilicate (rinse aid formed by heating a mixture of sand and sodium carbonate). 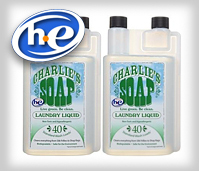 Fragrance Free, High Efficiency, Rinses Completely, Leaves Nothing Behind.